I don’t know about you but I am really getting sick and tired of all the Polar Bear drama included with the global warming drama. It seems like that when all else fails (like the recent Concun Climate Conference joke) then the MSM goes to work overtime to try to sway public opinion back toward believing there really is anthropogenic global warming. For some reason the usual liberal mantra of ‘it’s for the children’ doesn’t seem to work well with global warming, but they have discovered they get a lot of hits on the warmer websites when it’s ‘the Polar Bears are going to die-drown-starve-float helplessly on icebergs, have to swim farther,’ etc. That really seems to get all the warmers, greentards and PETA all stirred up. It seems the more failures we have about global warming the more we hear about those poor cuddly little Polar Bears and the ‘devastating’ effects that global warming will have on them. Though one would love to have you for a meal, people think they’re cute little cuddly creatures and feel sorry for them and may even send money in to save them. The latest crock of anthropogenic BS comes from the Daily Mail in an article alarmingly titled “Polar bears CAN survive global warming ‘but only if the temperature rise stays below 1.25C’,” which infers that we all better fall in line and cut down those CO2 emissions or we won’t have those Polar Bears to hug anymore. Polar bears can be pulled from the brink of extinction by a big enough reduction in greenhouse gas emissions, a study has shown. Scientists said there was still hope for the iconic Arctic predator which three years ago appeared to be doomed by global warming. Projections in 2007 indicated that by the middle of the century loss of Arctic ice will have reduced the 22,000 polar bear population by two-thirds. Eventually as temperatures rose it would be too late to prevent a catastrophic melting of sea ice, and the bears could vanish altogether. So, let’s look at the highlighted words. “Appeared to be doomed” meaning they really weren’t, the public figured it out, so rather than mass extinction being imminent we now have something we can all do to help stave that off. Better known as Plan B – Save the Polar Bears II. “Projections in 2007” meaning they use 2007 because that’s when the Arctic sea-ice hit a low. It hasn’t significantly dropped anymore, but they don’t want you to know about that as it might get you all un-excited and make you lose that touchy-feely stuff you have going about those cute white bears. “The bears could vanish’ is used because they want to keep you overly concerned so you’ll buy into Scam #2 or Plan B. Long story short, the article proceeds to try to hook you on the fact that while things perhaps aren’t that bad, they could be if we don’t do something immediately like all start driving Priuses. You can read it all at the source below, which I’d encourage you to do. Now that we have established the ‘con’ and the ‘hook’ let’s look at some reality for a change. Per Wikipedia, Polar Bears diverged from Brown Bears about 150,000 years ago. Please note that this is long before the warmers claim that CO2 became a problem (about 1850 per them). Now let’s look at the temperature graph below. I noted approximately 150,000 years ago with a red arrow. See what the temperature was then? What? Why wait? It was about the same as it is now! Yet that’s when Polar Bears evolved! When it was about the same exact temperature as it is today! 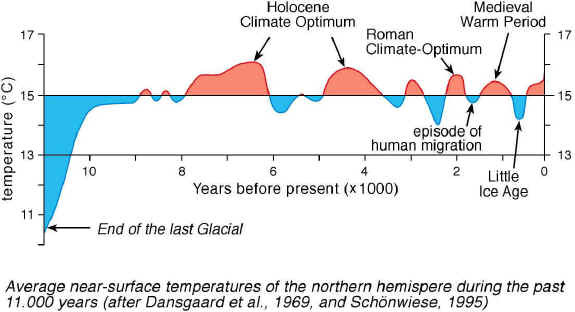 Note that about 125,000 years ago that it was +7F hotter than it is now? Notice about 10,000 years ago it again was +5F hotter than it is now? Yes, that’s right, they managed to survive two periods over this large-scale of time when it was 5F to 7F hotter than it is now! Yet we’re all supposed to get all touchy-feely about those poor Polar Bears who may not survive if we don’t all start living in caves and riding bicycles. Want to see more? 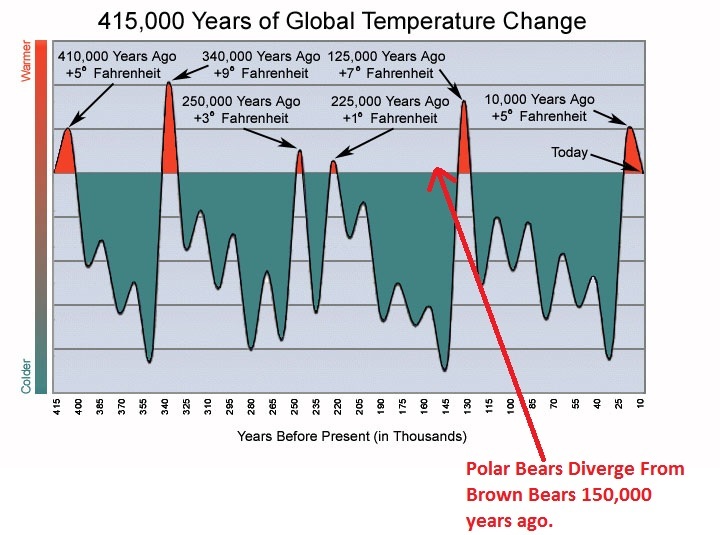 Below is another temperature graph of the past 11,000 years where you can plainly see we’ve had recent events where it was also hotter than it currently is. Oh my! The Polar Bears survived two Holocene Climate Optimums, a Roman Climate Optimum and a Medieval Warm Period, all warmer than now, and yet those darn bears are still here! I really don’t think we need to get very worried about them. You can even read here that their population is growing to the point they’re becoming a problem. More CO2 Insanity. More alarmist BS.